Interacción de iones con superficies. Transporte de carga en películas metalicas delgadas. “Resistivity and Hall voltaje of gold thin films deposited on mica at room temperature”, S. Donoso, A. Ibanez-Landaeta, M. Flores and R. Henriquez, Journal of Applied Physics, submitted. “Characterization of ZnS thin films synthesized through a nontoxic precursors chemical bath” C. Carrasco, C.A. Rodriguez,M.G. Sandoval, G. Cabello, M. Flores and H. Fernandez, Materials Research bulletin, submitted. “Magnetic properties of Co/Cu/Py antidot films with different pore diameters” J.C. Denardin, E. Burgos, R. Lavin, S. Vojkovic, J. Briones and M. Flores, Transactions on Magnetics – conferences, accepted. 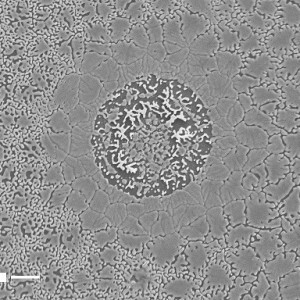 “Pulsed laser deposition of carbon nanodots array using porous alumina membranes as a mask”, S. Hevia, P. Homm, F. Guzman, H. Ruiz, G. Muños, L.S. Caballero and M. Flores, Surface and Coating Technology, accepted. “Photochemical synthesis of AZrO3-X thin films (A=Ba, Ca and Sr) and their characterization”, G. Cabello, L. Lillo, C. Caro, B.E. Buono-Cuore, B. Chornik, M. Flores, C. Carrasco and C.A. Rodriguez, Ceramics International, in press. “Moire patterns on STM images of graphite from surface and subsurface rotated layer” M. Flores, E. Cisternas, J. D. Correa and P. Vargas, Chemical Physics 423, 49 (2013). “Pulsed laser deposition of thin carbon films in a neutral gas background” F. Guzmán, M. Favre, H. M. Ruiz, S. Hevia, L. S. Caballero, E. S. Wyndham, H. Bhuyan M. Flores and S. Mändl, Journal of Physics D: Applied Physics 46, 215202 (2013). “Modification of self -assembled monolayers by highly charged ions”, B. O’Rourke, M. Flores, Y. Yamazaki and V. Esaulov, Nuclear Instruments and Methods in Physics Research B299, 68 (2013). “Electron scattering at surface and grain boundaries in thin Au films”, R. Henriquez, M. Flores, L. Moraga, G. Kremer, C. González-Fuentes and R.C. Muñoz, Applied Surface Science 273, 315 (2013). “Size effects in thin gold films: discrimination between electron-surface and grain-boundary scattering by measuring the hall effect at 4 K”, R. Henriquez, L. Moraga, G. Kremer, M. Flores, A. Espinoza and R.C. Munoz, Applied Physics Letters 102, 051608 (2013). “Topographyc study of gold thin films on mica by physical vapor deposition”, S. Bahamondes, S. Donoso, R. Henriquez, G. Kremer, R. Muñoz and M. Flores, Avances en Ciencias e Ingeniería 3, 79 (2012). “Pulsed laser deposition of carbon films in low pressure neutral gas background”, F. Guzman, H.M. Ruiz, M. Favre, S. Hevia, H. Bhuyan, H. Chuaqui, E. Wyndham and M. Flores, Journal of Physics: Conference Series 370, 012013 (2012). “Electron-surface scattering and the resistivity of thin gold films on mica: application of quantitative scanning tunneling microscopy”, M. Robles, C.A. Gonzalez-Fuentes, R. Henriquez, G. Kremer, L. Moraga, S. Oyarzun, M.A. Suarez, M. Flores and R.C. 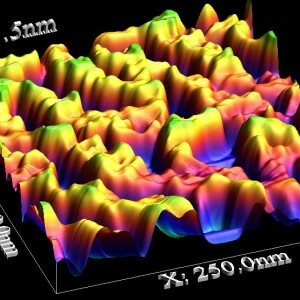 Munoz, Applied Surface Science 258, 3393 (2012). “Molecular ion emission from alkanethiol-SAMs by HCI bombardment”, M. Flores, V. Esaulov and Y. Yamazaki, Physica Scripta T144, (2011). “Resistivity of thin gold filmd on mica induced by electron-surface scattering from self-affine fractal surface”, R.C. Munoz, C.A. Gonzalez-Fuentes, R. Henriquez, M. Flores, Journal of Applied Physics 110, (2011). “Electron-grain boundary scattering and the resisitvity of nanometric metallic structures”, R. Henriquez, S. Cancino, A. Espinosa, M. Flores, T. Hoffmann, G. Kremer, J.G. Lisoni, L. Moraga, R. Morales, S. Oyarzun, M.A. Suarez, A. Zúñiga and R.C. Munoz, Physical Review B82, 113409 (2010). “Size effects on the Hall constant in thin gold films”, R. Henriquez, S. Oyarzun, M. Flores, M.A. Suarez, L. Moraga, G. Kremer, C. Gonzalez, M. Robles and R.C. Munoz, Journal of Applied Physics 108, 123704 (2010). “Secondary-ion emission from GaN(0001) and DDT/Au(111) surfaces irradiated with Arq+”, K. Motohashi, M. Flores and Y. Kanai, Journal of Physics: Conferences Series 163, 012080 (2009). “First-principles calculation and STM study of highly oriented pyrolytic graphite (0001)”, E. Cisternas, F. Stavale, M. Flores, C. A. Achete, and P. Vargas, Physical Review B79, 205431 (2009). “Development of a multi-coincidence SIMS analyzer for study of potential sputtering from solid surfaces interacting with highly charged ions”, K. Motohashi, M. Flores, Y. Kanai, and Y. Yamazaki, RIKEN Accelerator Progress Report (2009). “Potential and Kinetic sputtering of alkanethiol SAM by impact of HCI”, M. Flores, B. O’Rourke, Y. Yamazaki and V. Esaulov, Physical Review A79, 022902 (2009). Selected by the Virtual Journal of Nanoscale Science & Technology 19, issue 7 (2009). Co-investigator of FONDECYT Regular project Nº 1140192, entitled: “Neurotransmitter detection on self assembled monolayers”, 2014-2017. Associate investigator of ECOS-CONICYT program C12E02, entitled “Self-assembled monolayers on semiconductors and reactive surfaces “, 2013-2015. Associate investigator of Anillo de Investigación en Ciencia y Tecnología Project ACT1117 entitled “Interdisciplinary program of nanomaterials and molecular systems”, 2012-2014. Associate investigator URedes program, entitled “Grupo de materiales moleculares en superficies”, 2012. Co-investigator of FONDECYT Regular project Nº 1110168, entitled: “Electrochemical and hydrothermal growth of zirconian nanostructures on solid surfaces”, 2011-2014. Principal investigator of FONDECYT Iniciación a la Investigación project Nº 11100277, entitled ” Resistivity arising from electron scattering at grain boundary in thin copper polycrystalline films “, 2010-2012. Patrones inducidos térmicamente en películas delgadas de cobre. Trabajo de Tesis de Magister de Carolina Angúlo.